Thoughts and memories of journeys; learning and coping with this new "handicapped" label; and whatever else comes to mind! 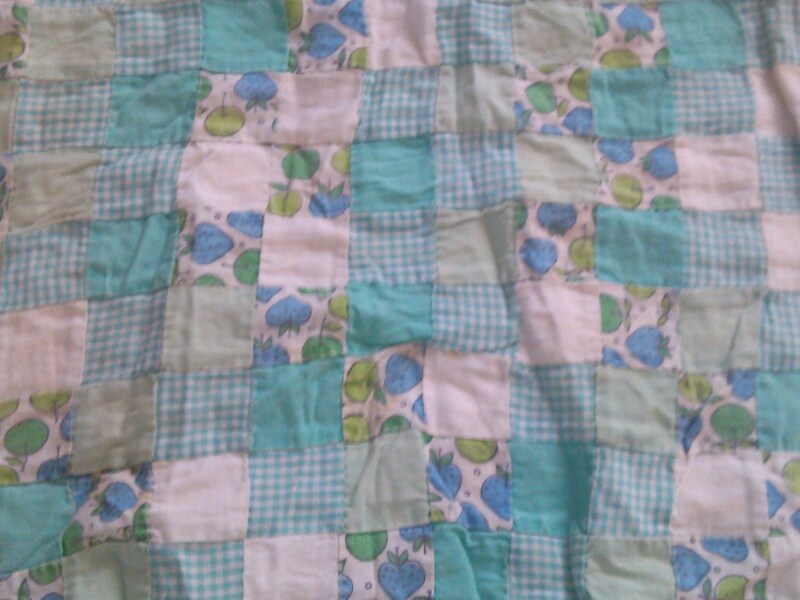 I still have the FIRST QUILT that my Mama ever made for me when I was a little girl, more than half-a-century ago. This is also the very FIRST QUILT that she ever made! I think that it is a treasure and I love it dearly. It’s called a ‘postage stamp quilt’ because that is the design: it’s basically a patchwork quilt ; however, all of these squares are as little as postage stamps. It does differ than an ordinary patchwork quilt in that this quilt does have a pattern in the way that the squares are placed in a particular order into long strips as they’re sewn together, and then each row is sewn together to complete this pattern. Usually most patchwork quilts do not necessarily follow patterns because they’re using up scraps of leftover cloth. Mama used to make dresses for my cousins and Aunty and herself and I, so she’d buy lotsa material. She also made a lot of curtains back in the 50s when it was popular to do so. So whatever fabric was leftover was cut into little squares and this was what she designed into her FIRST QUILT. I can still point to the squares and remember which of my dresses or tops had the same fabric! That’s part of what makes the quilt special. Mama has been trying to get me to throw this quilt away for the past dozen years or so! At this point she’s HANDMADE (never ever quilted by machine) over 325 quilts for folks!! What an amazing accomplishment! I am extremely proud of this! My Mama is soooo amazing! Myself, my children, my brothers and their children, my Aunty and her children, all have numerous quilts that Mama has lovingly made for us and we treasure each and every one of them. Most of Mama’s friends have commissioned her to make quilts for their own kin’s weddings or babies or graduations, etc. Plus Mama is regularly DONATING quilts to church raffles, nursing homes, and even soldiers’ hospitals overseas. This fills my heart. So for me to throw away her very first one, even tho it most definitely is old and fragile and could probably never be washed again or it’d likely fall apart, would surely cause me much dismay. Believe it or not, my kiddies NEVER had a bedspread! They always had Grandma’s quilts on their beds. Me too. I wouldn’t have it any other way! There’s such a ‘homey ‘ look about a house that has bedrooms with a quilt on every bed, especially when those quilts are made by loved ones. My belief has always been that if the house catches on fire : kids out 1st, quilts 2nd, photo books 3rd! So many times, as Mama would lovingly present me with a new quilt to put on my bed, or another lap quilt for the living room, she’d say : “NOW will you get rid of that old green quilt?” As if she REALLY REALLY thought that I would!! Every time she tries….and every time I turn her down. This was the FIRST QUILT that she ever made PLUS it’s my fave color PLUS this daughter-of-hers just cherishes it, and her, toooo much to ever even consider it! I LOVE MY MANY QUILTS!!! I get so very irritated at my first-born child over what he chooses to deem his ‘LIFESTYLE CHOICE‘! In this day and age when that term can have a plethora of meanings, for my 32-year-old son the meaning is that he doesn’t drive! He takes the bus to and from his job at DisneyWorld and his wife hauls him around with her wherever else they wanna go. For now, the two of them have the same days off each week even tho he is a Food Service Trainer at Magic Kingdom and she coordinates training at a Disney resort. So it’s working out well for them….but not for me! My son never gets to ‘pop over for a visit’ or to ‘pick up something at the store on the way home’ for me or to ‘run an errand for his handicapped Mama’. Whenever he DOES get a chance to come over, it has to be planned at least a couple of weeks in advance (even tho he lives a mere 4&1/2 miles from me); and then if we go out to eat….I’m the only one doing the inviting and also doing the paying (even tho I’m on a very tight ‘fixed income‘ while they have two salaries). Or if I do need my 6-foot son to clean the ceiling fans, or something else that my 4’10” daughter (with whom I live because I don’t have enough income to live elsewhere) cannot reach, then I need to have a list ready for him plus I actually gotta PAY this child-of-mine for services rendered so that he can have some spending money because his wife gives him an allowance and he probably needs cigarettes! Grrrrr! When I was young, I lived far out in the country and couldn’t wait to get my driver’s license so that I could drive, drive, drive! 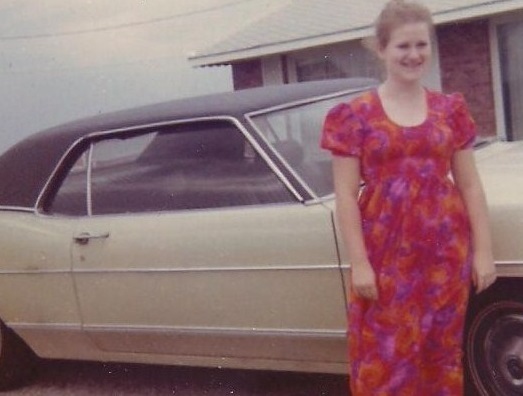 The photo is of my 1st car, an ugly pale yellow Ford Galaxy 500. But it got me where I wanted to go and most importantly was that I didn’t have to ride that darned old school bus anymore!!! YAY! Of course there was a catch and that was that I had to wait around after school until football practice was over and bring my younger brother home. I also had Marching Band practice before and/or after school sometimes too so I didn’t mind. Then in the winter I had to wait again after school for my brother to get outa wrestling practice, and then in the spring it was baseball practice. Oh well, Daddy bought my car and put in most of the gas so this was a pretty decent trade-off for all of us since we really did live soooo far out of town away from the High School. My son and his wife have been living in the same tiny 1-bedroom apartment for a few years. He recently told me that they are about to sign yet another year’s lease. It’s not the nicest apartment but it is where they began their lives as newlyweds and also where they got their dog. I’m sure they’re sentimental. He told me the other day that they’re planning to only stay one more year, as they’re wanting to save money to buy a house in a particular area. They may even have a house built because there are a couple of subdivisions being planned near a new shopping area that we all really like and have been looking into and enjoy a lot. He told me the prices and I do think that it’s too expensive but I won’t say anything because I don’t wanna be that ‘meddling mother-in-law‘ (altho I certainly haven’t any qualms about telling just him my opinion, haha) that so many TV sitcoms depict so badly! IF AND WHEN this does happen, at that point my oldest child will most-definitely need to re-think his ‘LIFESTYLE CHOICE‘ simply because there are no city buses in the Orlando area that have stops in that vicinity! I really don’t foresee him leaving his high-seniority Disney job to go into retail at this point! Hmmmm, here’s a thought: his only other job that he’s ever had prior to Disney was managing a movie theater and THERE IS definitely a very nice movie theater in that shopping center plus it’s the same company that he previously worked for! This Mama sure does miss those free movies!!! Well, for the first time I’ve now been called SILVER and FOXY LADY by the same person at the same time! Oh my, I just don’t what to think! Glad? Sad? Mad? So here’s what happened : I took myself to lunch at 1 of the Chinese buffets that I regularly visit. 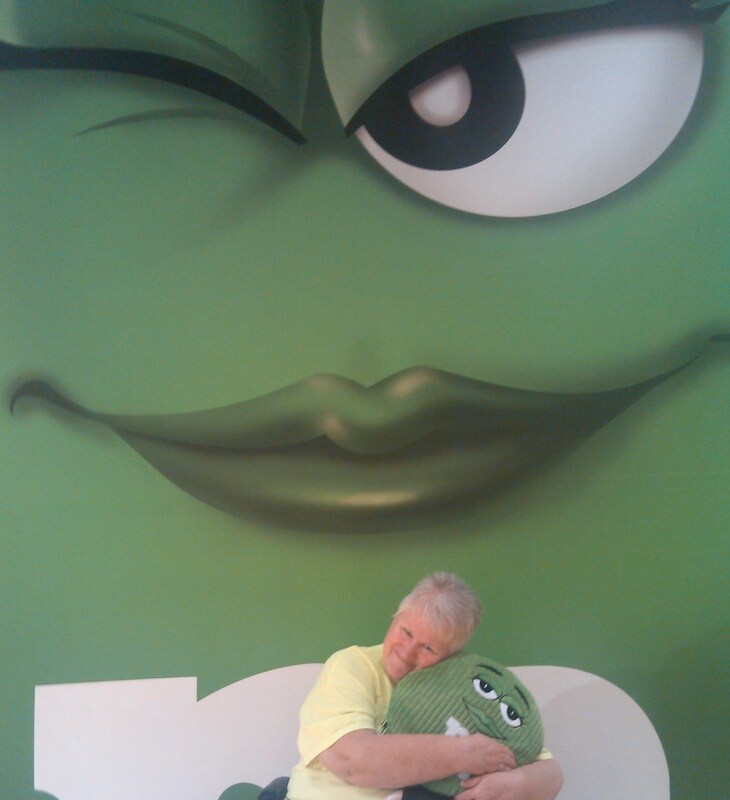 Of course I was wearing lotsa green for St. Patrick’s Day! This particular restaurant has a nonchalant host & several ever-changing young waitresses that barely speak enough English to get by (to be expected around here in central Florida, the ‘tourist capital of the world‘). Most of the Guests were workmen or ‘old farts’ like me, many of us are also what I call ‘regulars’. Anyway, in comes this 30-ish couple. The woman’s shirt says “DON’T TALK TO ME, STAY AWAY” & the man’s says “JUST LEAVE ME ALONE”….so they sit in a booth & don’t even look up from their phones or seemingly pay any attention to each other or their surroundings (this is a buffet). Three other tables of Guests enter and are seated and brought drinks. The couple then notices this, and the woman says to the man “WTH do we gotta do to get waited on around here?” The man is looking irritated while some of the regulars & I are eyeing each other, just waiting to see what is gonna happen. The timid little Chinese waitress looks frightened, but our host is VERY protective of his girls….he walks over to her & tears off a page of her order book & places it + a pen on the table of the couple w/the rude t-shirts~~ for them to write down their own drink orders! I badly wanted to laugh! An old Veteran muttered something aloud that I won’t print. Then it made my my day when about 5 minutes later someone passed me & said “I love that shirt” but before I could respond, the “don’t talk to me” woman said “Thanks” but the man quickly and loudly said “I was talking to this SILVER FOXY LADY with the bright green M&Ms shirt, certainly not you!” At that point, everyone was laughing! ME? I was probably BEAMING!